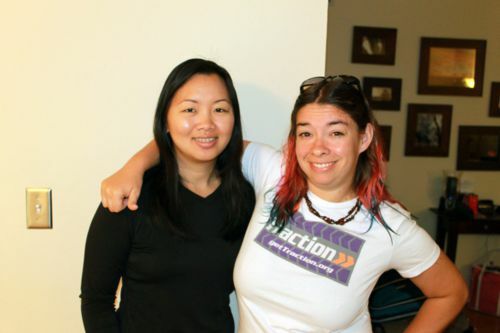 We’ve finally reached it—the end of this blog series on my California trip in October. Apparently, when I delay going home for too long, I end up generating way too much blog material. I didn’t expect this series to be nearly as many posts long as days the trip took! 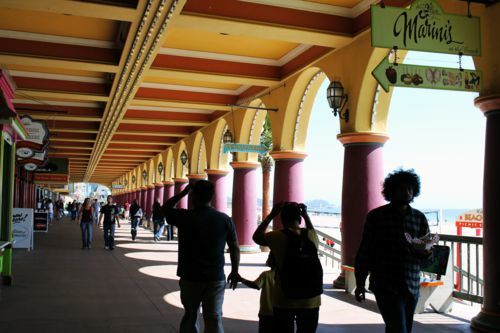 I’ll be working on blogs from our recent Philadelphia trip soon, but for now, enjoy this photogenic stroll around the Santa Cruz pier and boardwalk. 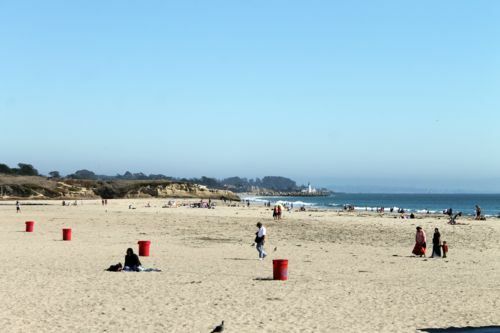 If you haven’t done the Santa Cruz experience before, you simply must walk along West Cliff Drive for an afternoon or early evening. Heck, I think a West Cliff walk is necessary every time I’m in town. 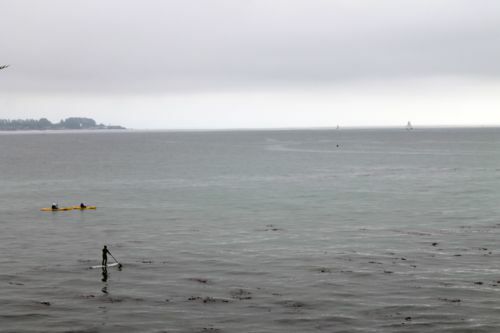 How else do I see such standard Santa Cruz sights as kayakers in the water? 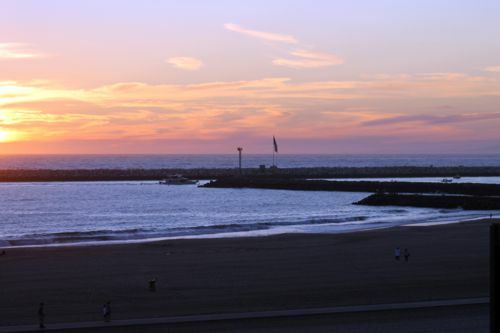 Now if I’d been in town just a week later, there’d probably have been a gray whale in that shot, too. 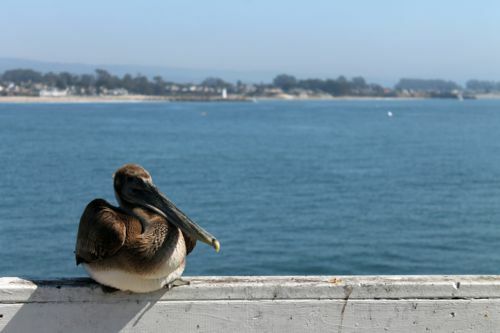 Santa Cruz had an invasion of them in mid-October! Here’s the pier and boardwalk view when rounding one of the last corners on West Cliff Drive before getting to them. 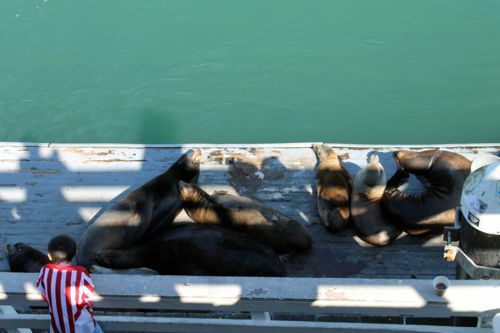 And here’s a common sight on the pier, which is especially nice after finishing clam chowder in a sourdough bread bowl. 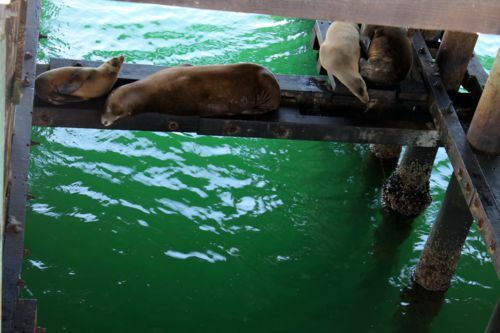 Also common are the sea lions that live under the pier. You can hear them barking miles away from the beach at night, tripping my husband out each time he hears them when we first get to town. And here’s the view of the boardwalk from the pier. Click here for the full panorama. 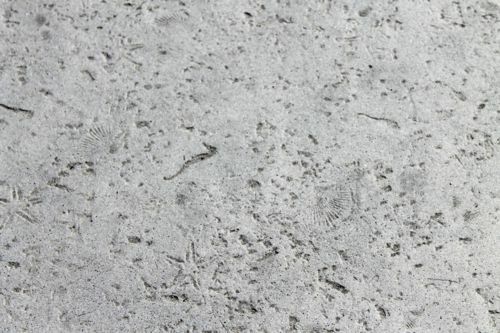 You probably don’t want to know how many times I’ve had a moment of realization that the sidewalk leading to the pier is covered in seahorse, clamshell, and starfish imprints. But you have to admit it’s pretty cool, right? 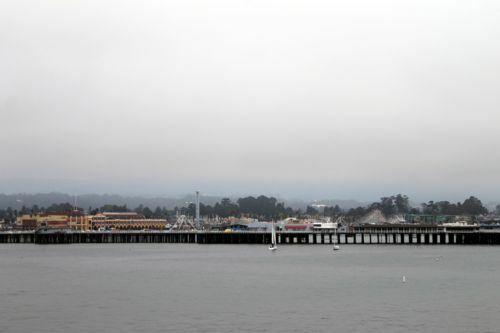 Here’s a view of the pier once we left it behind and headed down the block to the boardwalk instead. 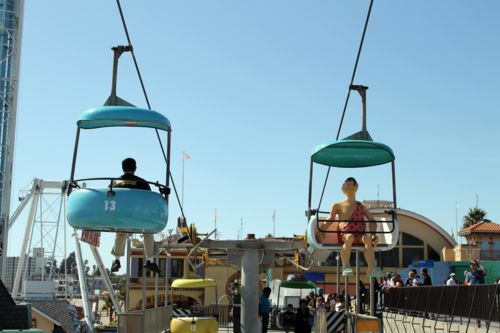 Now the Santa Cruz boardwalk is pretty awesome, even though rides are WAY too expensive. 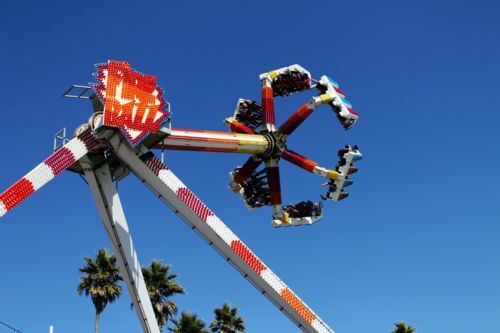 But if you’re there in the summer, I think Thursday nights are Family Fun nights with all rides at only 50 cents in my day—probably closer to a dollar each now that it’s a decade later. Wow, it’s been almost a decade since I graduated college. Let’s ponder that sadly for a moment. 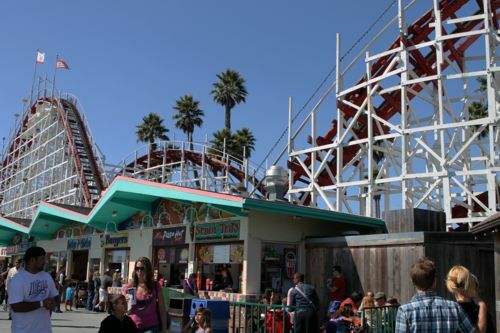 The Giant Dipper, a wooden roller coaster, dates back to 1924, and I can verify that it’s one of the jerkiest roller coasters I’ve ever been on. Here is an obscured view of its dips. 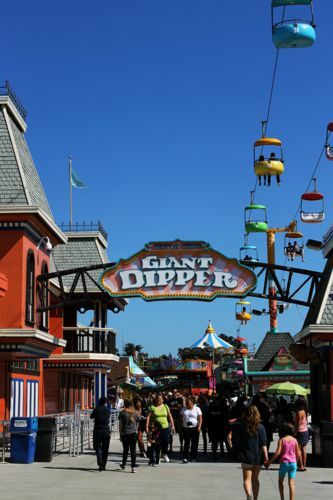 The Giant Dipper is the boardwalk’s most famous ride, but there are several worth checking out. 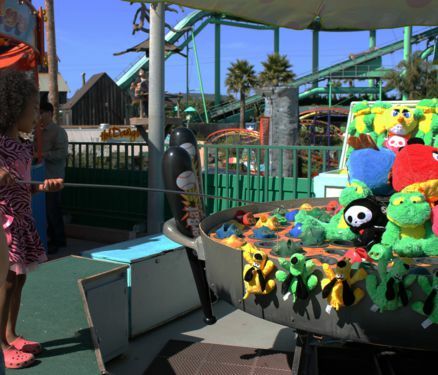 Here’s a little girl playing a life size “Let’s Go Fishing” game. 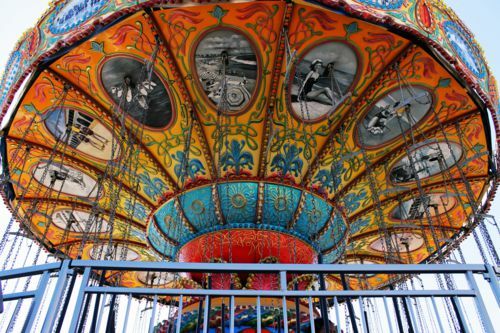 I had one of those as a kid and I loved it. 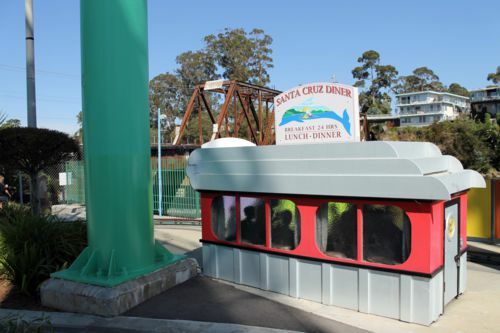 The Santa Cruz Diner, known to anyone in town who’s ever needed a 24-hour restaurant and didn’t want Denny’s, gets its own model on a sad little train track in the kiddie area. 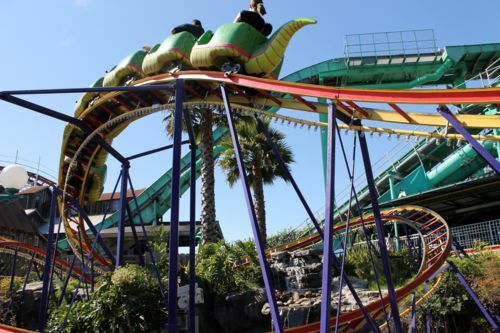 I love kiddie roller coasters, and this one’s of a dragon! Yippee! 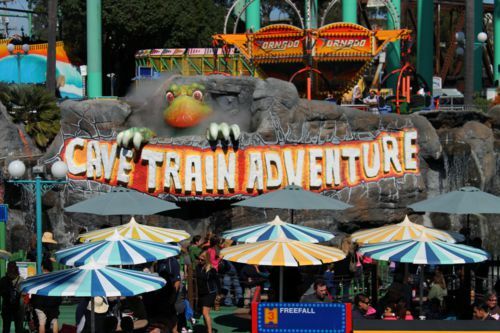 Here be gargoyles outside the haunted house, wishing they could fly like those sky cars. And who doesn’t want to play a game called Stinky Feet? 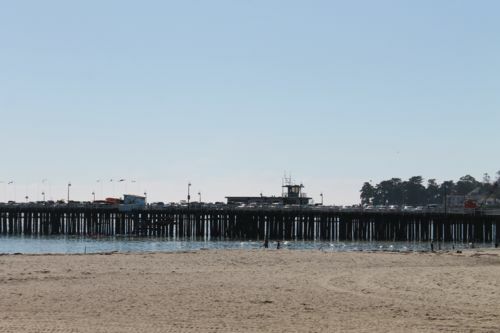 And here’s one last view of the Santa Cruz boardwalk beach. 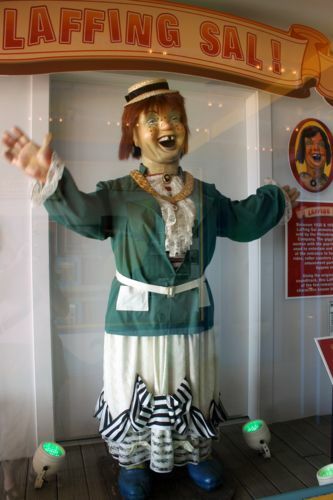 After that afternoon stroll, Ben and I headed up Highway 17 to visit our friends in NorCal and have a game night where I got to dominate two pinochle games. I occasionally wonder how much of my life I spent playing pinochle in college, but I wouldn’t trade it for the world. 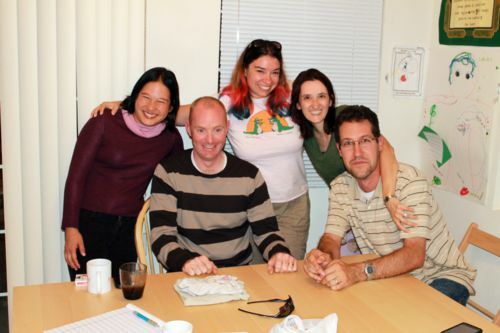 Here’s the pinochle crew of the evening, at Jason and Janelle’s pad. And my last photo of the trip was a goodbye hug with Ann, after spending the night at her, Paul, and Cole’s house. Farewell, California. I promise not to let three years pass before I see you again next time. Heck, I plan not to let 6 months pass if I can make it for that April wedding! Dude, y’all, I miss those sunsets already. If you’d like to peruse more pictures of our trip, head on over to our photo site.